Pressure washer features good mobility suitable for all types of applications! Great for cleaning stairs, lawn equipment, farm equipment, fencing, decks and patios, garage floors, driveways, siding, second stories of homes, boats, cars etc,. You name it will clean it. The washer also has a detergent feed that attaches to the outlet side of the pump which enables you to apply a detergent before a high pressure spray. Just a matter of the the pipe in a detergent container and changing the nozzle to the black low pressure one. It has four inter changeable nozzles with you would need for different jobs. The narrowest for those really stubborn stain and last for damping down of applying chemical. See the pictures provided. Q. Are spare parts readily available if I need them? A. We we carry all spare parts in stock. Pull cords, spare lances, pump faces, complete pumps, spare hoses, spare nozzles, petrol caps, ignition coils and many more. Q. I clean driveways, patios and roofs for a living. What is the warranty? A. There is no commercial warranty with this machine. Whilst the pressure washer is very durable following the user instructions all parts and labour cost will for commercial use will have to be paid for. Q. I find my pressure washer is very difficult to turn over what do you suggest? A. The easiest way to start your pressure washer is whilst pulling the pull-cord is to have the trigger on the lance depressed. This way any water that is pumped when you turning the engine over gets released through the lance and doesn't build up resistance. Q. I am having trouble starting my pressure washer. Can you give me some advice please? A. The engine need only two criteria to start. One is fuel the other is spark. In most case its the oil level is too low causing the the low oil level switch to give the ignition coil an earth. The oil level should right at the top of the thread of the dipstick. That is the correct level. Q. My pressure washer is pulsating. The engine revs are going up and down. Can you advise what could be wrong? A. One of three things can cause this. The first is a blocked nozzle. Clean the nozzle with the tool provided with the machine. The second is low water pressure.Check the water pressure at the inlet pipe. The third is you are over reeving the engine. You have pushed the throttle passed its stop. Revving the engine more will not produce any more pressure just cause damage to the internal pump bearing. Put the throttle to it correct position. Q. I would like to see a demonstration and have my pressure washer built up up for me as I am not too mechanically minded. Is this possible? A. 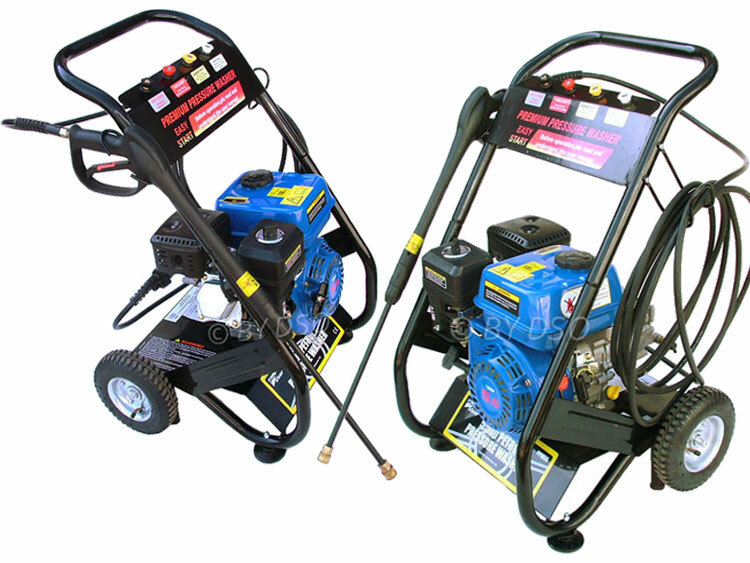 We can fully assemble your pressure washer, fill with correct oil and enough fuel to get it going, give you a full demonstration and show you all it's functions. This build up, demonstration and PDI service will cost ?20.00. This is only available for collections only. We cannot transport the pressure washer fully built or with any oil or fuel in it. Q. Do I need to do anything to the pump before I start using the pressure washer? A. No nothing to do. The pump is filled at the factory with the correct oil and to the correct level. Q. If I have a problem with my pressure washer is it possible to speak to someone about it? A. Yes we have a full time technician who will gladly help you. Just send us a mail with a contact number and a brief description of the problem and our technician will give you a call. This item to paid by Paypal mass payment and bank transfer only. Contact us for details.